JumpMind provides support services to help you overcome technical issues during the development stage. We answer implementation questions and troubleshoot issues to ensure the core software operates as designed. Certified Version - Customers always have access to the latest version of the software that is certified for production use. Maintenance Updates - Maintenance updates are released periodically to fix bugs, configuration, and performance issues that keep your deployment up to date. Requested Bug Fixes - Customer can request to expedite the fix for a specific bug that has been reported. JumpMind will make a reasonable commercial effort to fix the bug and deliver as a patch release. Version Support Period - A minor release (X.Y) of the software is supported and updated with maintenance releases for the specified time period. An extended support period is available on request. Knowledge Base - A collection of articles that identify common issues and how to resolve or workaround them. Support Forum - A web-based forum for users to discuss issues and other topics during the course of their project, with the benefit of involvement from JumpMind experts. Issue Tracking - Customers enter their issue into the tracking service where they can monitor its progress. During the resolution process, the customer and support engineers can add comments, upload attachments, and update the status. Web / Email / Phone Support - Depending on the level of support, customers have access to support engineers through the web, email, or phone. Issue - An issue is a single support incident with a JumpMind product and the reasonable effort needed to resolve it. 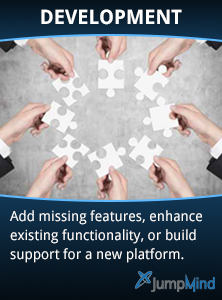 A single support issue is a problem that cannot be broken down into subordinate parts. Named Contacts - Support is provided to the Named Contact(s) provided by the Customer. End users requesting assistance will be redirected to their respective Named Contact. Support Access - Customers gain access to support engineers during business hours (9 am to 5 pm Eastern Time, except holidays). Response Time - Customers benefit from a guaranteed maximum time when a support engineer responds to an issue. A response means that JumpMind will contact the Customer to (i) acknowledge the issue report, and (ii) gather more information in order to assist with problem resolution. SymmetricDS Pro - With an Enterprise subscription, customers can protect their investment with access to the source code for SymmetricDS Pro. Commerical License - With an Enterprise subscription, the SymmetricDS and SymmetricDS Pro source code are provided under a commercial license so you can freely modify and use it with proprietary software. Determine the feasibility of our products and get answers to your questions quickly.